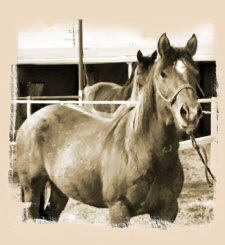 "Lacy's Flirtation" was a lovely, soft-gaited mare (mother of Butch) who passed away about a year after she was adopted. She was a very kind, sweet mare and has given her wonderful attributes to her son, Butch. 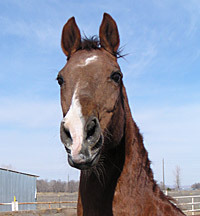 Bluefield's Stone of Fortune aka "Stones" was humanely euthanized in the fall of 2010 after developing a severe neurological problem which caused him to fall and not re-stand. 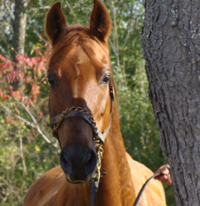 Caesar was a sweet, loving, older, unregistered Saddlebred who spent his final years in Rhode Island in a wonderful green pasture with loving care all around him. He was humanely euthanized after having suffered ill effects from having had an advanced case of Lyme's Disease and having barely survived Potomac Horse Fever. 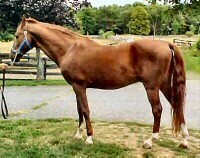 Millie came to us from the CSU Auction of repro mares in November of 2003. We had Millie evaluated in September of that year and noted she was quite sore in both front feet—we hoped it was due to bad trimming at that time. We brought Millie home and gave her some time for her feet to grow in hopes that it would make her feel better. When she continued to be in pain, we had x-rays taken of Millie's front feet and legs. We found she had sesamoiditis in both front legs and moderate/severe navicular changes in both front feet. We wavered in the decision of what to do—we thought perhaps we could make her more comfortable with shoes and pads. However, knowing that Millie needed to be sedated to be trimmed due to the pain of loading her weight on only one front foot hastened our decision. Millie was humanely destroyed on February 17, 2004. We believe CSU had—and ignored—a responsibility to Millie. The professional veterinarians at CSU should have recognized and addressed her pain—using the opportunity to instruct their students in diagnosing her lameness and when found untreatable, directing euthanasia. Instead of diagnosing Millie, CSU tried to make a profit from her by selling her at auction, where she became "someone else's problem." Instead, it took volunteers from Lynchland Stables, financial resources from Horses Forever and the professional kindness of Equine Medical Services and Highland Forge to help her. We can't thank those wonderful people enough. 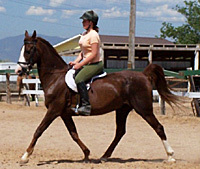 Big City Airs was a big, athletically built mare who was a product of American Saddlebred immortals. This daughter of the brilliant stud and competitor, WGC Yorktown, son of the dynasty founding five gaited WGC Wing Commander was out of Putting On Airs. This brilliant broodmare Hall of Fame member was by the Wing Commander son, Mr. Magic Man, and out of the gorgeous black daughter of Stonewall Supreme, WGC Supreme Airs. The dam of twelve registered foals, Big City Airs produced champions like CH Starlike Airs and wonderful producers, such as Santana Airs. However, this is where the story of this mare loses its luster. 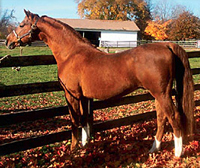 Big City Airs arrived at the Farm of an Amish American Saddlebred breeder in the fall of 2004 in emaciated condition. Ecstatic at the prospect of owning such a well bred broodmare, this Saddlebred devotee had been happy to trade one of his well-bred in-foal mares for the chance to have Big City Airs on the farm. He had not seen her before and relied on the advice of a West Virginia breeder and trainer, with whom he had done business before, in trading his mare for the possibility of breeding from some of the greatest bloodlines in the breed. Unfortunately, this was not to be. Delivered in debilitated condition, this grand old lady had to be humanely destroyed less than a month later in spite of the best efforts of her new owner and his veterinarian. Not a fitting end for any horse, let alone this product of one of the best American Saddlebred breeding farms, and of the best lines. While Big City Airs is gone, her name lives on in the papers of her daughters and sons and their foals. Horses Forever seeks to make this world a better place for all of them, but we never forget those who we could not help. Godspeed, Big City Airs. Jimble Jamble is a 1984 registered American Saddlebred mare that was always a broodmare before she came to Horses Forever. Then several months after her arrival she proudly delivered a wonderful, stud colt, Hiview's Country Prince. She foundered in her past and we keep her in front shoes. She has now reached a point that it is not wise for her to go under saddle. She absolutely loves people and thrives on personal attention. She is our "greeter" to all newcomers and just loves young people. She will make a wonderful companion horse. O'Shay was named because we thought he looked like the O'Shay bloodlines. He came to us through a "kill" sale after having been abandoned in a pasture in mid-Colorado. He went well under saddle when he was younger but now that he is older we have not ridden him for several years. He is kind and gentle and very easy to handle. He is very rewarded with TLC and a "treat" once and a while – the perfect companion for another lonely horse. My Daddy is very FAMOUS. I have lots of half brothers and sisters. My Mother is very FAMOUS. Since she got FAMOUS, she has only had foals. No more loving hands, no more daily grooming...just foals. She is always sad when they leave her. I didn't want to go so I hid behind my mama. But, one day, they said, I would be FAMOUS. I wonder, is famous the same as fun and good times? even though you were concerned that it took an hour to catch me. I don't think you like me. My new home is far away, I am scared and afraid. My heart says be brave. Did they go to good homes like mine? I'm hungry because I can't eat too much, it will be bad for my bones. I can't play with the other horses because I might get hurt. I'm in a big green field with the butterflies and robins and frogs. I can't understand why they hate me! I am quiet but the man hits and says loud things. The lady doesn't feed me good things like I had with my mother. before I can get too close for touching and petting. Sometimes my food smells bad but I eat it anyway. Today I had a baby. He is so wonderful and warm. I wish I could play with him but I am so tired. I am so young that it is hard to be a good mother. I wish somebody would throw me some food. I am so very thirsty. He got cold during the night and we have no shelter. I couldn't make him warm again. Maybe if I whinny someone will notice us and give us food and water. Today they took US away. To a place with many other horses. There were lots of people and loud noise. Someone grabbed my foal. He was so scared. Is my baby FAMOUS now? I hope so because I miss him. I was put into a large trailer with many others in it. It is crowded and smells of urine, fear and sickness. I was beautiful like my ancestors. Now I am hungry, dirty, in pain and unwanted. Maybe the worst is unwanted. No one spoke to me in gentle tones or stroked my soft neck. I am in a small pen with many other horses. I am SCARED and ALONE. They chased us from the pen and into a room. One by one we were herded into a chute. I hear screams of agony, sounds of thrashing, and then silence. Someone came and put me into the chute. Someone reached in and patted my nose. I felt tired and laid my head over the last one who cared. I am ready for what will come next. All content © 2004-2015 Horses Forever except works used here under copyright of others.